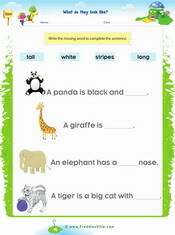 Learn and practice zoo animals vocabulary and sentences. You will find tracing worksheets, crossword puzzles, word search puzzles, matching exercises and more. 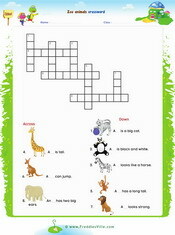 This worksheet is a gap fill exercise with words related to zoo animals. 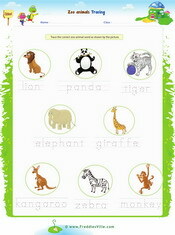 Words used include: Lion, elephant, panda, giraffe, kangaroo, monkey. 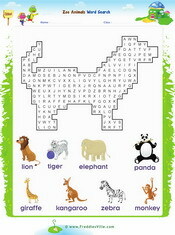 Words used include: Zebra, tiger, panda, lion, elephant etc. 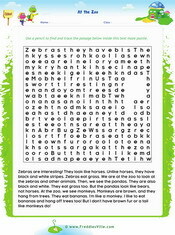 This is a fun reading comprehension exercise involving the use of zoo animal vocabulary.